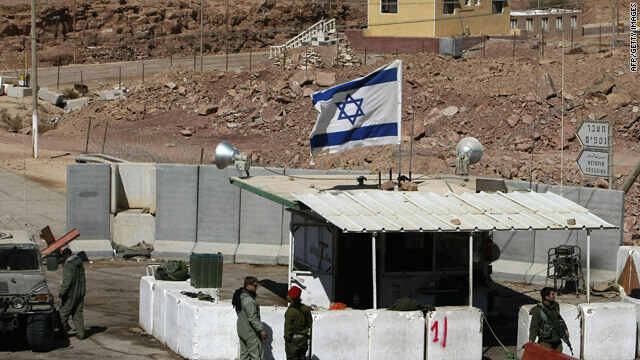 Israeli soldiers stand at an army checkpoint in the Eilat Mountains in southern Israel near an Egyptian military post in March 2009. Benjamin Netanyahu says "strategic decision" will "ensure the Jewish and democratic character of the state of Israel"
JERUSALEM (CNN) -- Israel will build barrier along its southern border with Egypt to stop illegal crossings, the prime minister said. "I decided to close Israel's southern border to infiltrators and terrorists after prolonged discussions with government ministries and professional elements," Prime Minister Benjamin Netanyahu said in a statement late Sunday. "This is a strategic decision to ensure the Jewish and democratic character of the state of Israel. "Israel will remain open to war refugees, but we cannot allow thousands of illegal workers to infiltrate into Israel via the southern border and flood our country," he added. Israeli police estimate that 100 to 200 people infiltrate Israeli's 210-kilometer (130-mile) southern border weekly. Israel's Hotline for Migrant Workers, a group that promotes the rights of undocumented workers, puts the number at "a few thousand" a year. Ninety percent of those crossing the border illegally are refugees from northern Africa, the group said. The rest are thought to be migrant workers or traffickers of drugs and women. Construction of the barrier with Egypt is expected to take several years, according to the prime minister's office. No start date has been announced. The estimated cost of the project is 1 billion shekels (about $269 million). The fence will be built in two sections. One will begin near Rafah and run south, while the other will start near the resort town of Eilat and go north. The barrier will not cover difficult terrain in the middle that already discourages border crossings. Israel has already built a controversial barrier separating the West Bank from the Jewish state. Construction was begun by Israel in 2002 in the stated attempt to stem the tide of Palestinian suicide bombing attacks that became a frequent and deadly occurrence in Israel during the course of the second intifada which began in September 2000. The barrier is currently over 400 km (248.5 miles) in length and is comprised of 20-foot sections of concrete wall in more densely populated areas and large barbed wire fencing in rural sections. Construction of the full 700-plus kilometers (435-plus miles) of the barrier has stalled considerably in the last two years as a result of court challenges and budgetary issues. Last July the U.N. High Commissioner for Human Rights Navanethem Pillay urged Israel to "dismantle" the barrier and "make reparation for all damage suffered by all persons affected by the wall's construction" on Palestinian land.